Two recent attacks against the Syrian Arab Army in east-Syria point to a U.S. plan to eliminate all Syrian government presence east of Palmyra. This would enable the U.S. and its allies to create a “Sunni entity” in east-Syria and west-Iraq which would be a permanent thorn in side of Syria and its allies. Note that the described plan mentions exactly two cities – Hasakah and Deir Ezzor. On August 18 Kurdish YPK units suddenly attacked Syrian government positions in the center of Hasakah in the north-east of Syria. Before this incident the relations between the two entities had been decent despite some earlier, small clashes. The attacking Kurds were under advice from U.S. special operators. When the Syrian air force intervened the U.S. threatened to down its planes. The Syrian forces had to eventually retreat from populated areas in Hasakah and are now confined to an airport next to the city. They are cut of from supplies and will eventually have to give up. On Saturday U.S. airplanes attacked the most important Syrian government position in Deir Ezzor. Nearly a hundred Syrian soldiers were killed and most of the heavy equipment the Deir Ezzor garrison had left was destroyed. Immediately after the attack fighters of the Islamic State occupied the bombed out government positions. These Islamic States fighters now own the heights above the Deir Ezzor airport. A day later the Islamic State shot down a Syrian government plane near Deir Ezzor. The city and its 150,000+ inhabitants are surrounded by the Islamic State. They had been supplied from Damascus by nightly flights to the airport. As the Islamic State now has fire-control over the airport as well as anti-air weapons those supply flights are no longer possible. The U.S. air attack practically closed down the Syrian government ability to supply the city. If this situation continues the city will fall to the Islamic State. The U.S. plan is to eventually take Raqqa by using Turkish or Kurdish proxies. It also plans to let the Iraqi army retake Mosul in Iraq. The only major city in Islamic State territory left between those two is Deir Ezzor. Should IS be able to take it away from the isolated Syrian army garrison it has at least a decent base to survive. (Conveniently there are also rich oil wells nearby.) No one, but the hampered Syrian state, would have an immediate interest to remove it from there. 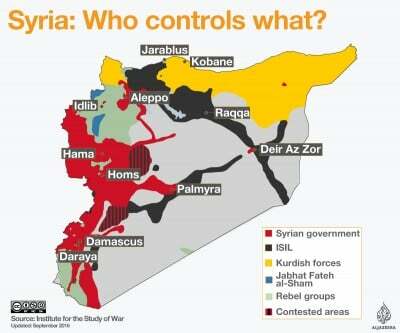 North of that entity would be a Kurdish area with no ambition to expand south. 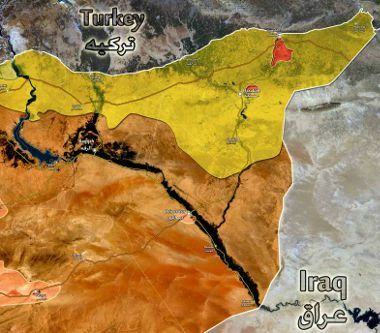 North-west of the Deir Ezzor entity would be the friendly Turkish controlled “Safe Zone” that Erdogan plans to create. The two recent moves by U.S. forces in east-Syria are consistent with the plan for a “Sunni entity” or “Salafist principality” described in the 2012 DIA document. Such an entity blocks the land connection of the “Shia crescent” which connects Iran, Iraq, Syria and Lebanon. This is the “isolation” of Syria foreseen in the DIA analysis. A “Sunni entity” in east-Syria also provides a path for the gas pipeline from Qatar via Turkey to Europe. The Syrian government had rejected the construction of such a line which goes against the fundamental interests of its ally Russia. At first glance this U.S. policy seems to be shortsighted, There is no way the envisioned “Sunni entity” would ever become stable. Instead it would continue to be a source of terrorism which would hit far beyond the borders of Syria and the surrounding states. But it is exactly the instability of this construct that will allow for further U.S. presence in the area. A source of insecurity that can be activated, or shut down, whenever convenient.